While you may view the month of April as a final goodbye to winter, it signifies more than just the start of spring. 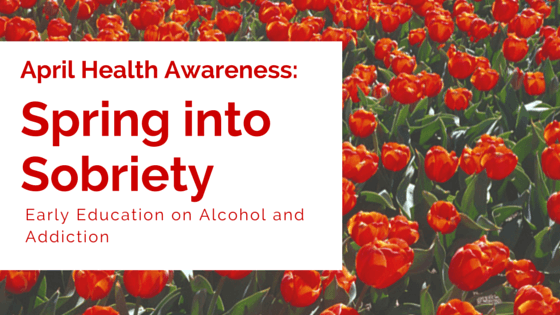 Since 1987, April has also been designated as Alcohol Awareness Month. According to the CDC, 51.3% of Americans over the age of 18 are considered to be regular drinkers, or someone who has consumed at least 12 drinks in the past year. Not only does this increase their risk of alcoholism, but it can have a significant impact on their physical and mental health, as well as the health of those who love them. Preventing alcohol abuse saves lives, and moderation is crucial for alcohol abuse prevention. Moderate alcohol use is considered safe; in most cases, moderation is considered to be up to 2 drinks a day for men and 1 drink a day for women. This does not refer to an average over several days, but to the amount of alcohol consumed in one day. If you believe that a family member or close friend may have developed an addiction to alcohol, it is important to communicate openly with him or her regarding your concerns. Do so without anger or judgment. It is crucial to approach this topic when they are sober and in a location that provides privacy. You should start the conversation by making it clear that you are doing this out of love for them and a true concern for their safety and wellbeing. You should be able to provide examples of times when his or her drinking has resulted in a problem. Stay calm and stick to the facts, even if the other person becomes upset. If you fear that you are an alcoholic, you should discuss your concerns openly and honestly with someone who trust. Acknowledge that you believe you have a problem and ask for help. If you are the parent or guardian of a teenager, it is important to understand that alcohol abuse prevention should start before it has the chance to be a problem. A study completed by The National Study on Drug Use and Health (NSDUH) found that people who have their first drink of alcohol before the age of 15 are 5 times more likely to abuse or become dependent on alcohol than those who are 21 or older at the time of their first drink. Alcohol abuse can have a tremendous impact on your teen for the rest of their life, so be open and provide the education they need. According to the National Institute on Alcohol Abuse and Alcoholism, as of 2012, 17 million Americans over the age of 18 and 76,000 adolescents reported they had a problem with alcohol abuse. Don’t let someone you love become part of these statistics.